Young voters—those under the age of 36—are now the largest eligible voting bloc in the United States and are poised to have a major impact on the 2018 midterm elections. According to a new analysis by the Center for American Progress and its youth advocacy arm, Generation Progress, 70 million young people, U.S. citizens under the age of 36, will be eligible to vote in 2018—outnumbering every other generation. These young voters represent the demographic future of this country. CAP analysis of 2017 American Community Survey data finds that Millennials and Generation Z are more racially and ethnically diverse than any previous generation, and 14 percent of young adults ages 18 to 35 were born in another country. On the issues, young people tend to hold more progressive views than older generations in regards to LGBTQ rights, gun violence prevention, reproductive rights, and college affordability. It is not surprising, then, that recent polling found that 72 percent of 18- to 29-year-olds disapprove of President Donald Trump. With regards to immigration policy, recent polling found that while a majority of all Americans are sympathetic toward undocumented immigrants, young people were even more likely than older adults to hold those views. And poll after poll shows the general U.S. population overwhelmingly supports undocumented immigrants who came to the United States as children—also known as Dreamers. Young voters could be the strongest supporters of the undocumented community in the midterm elections this November. This analysis* compares the number of young eligible voters with the number of Dreamers currently living in the United States to illustrate that young people, especially those who live in certain states, represent the largest U.S. voting population—and are therefore the most powerful group of voters that can stand in solidarity with their undocumented peers. In its first two years, the Trump administration has targeted immigrants, asylum seekers, refugees, and their families. 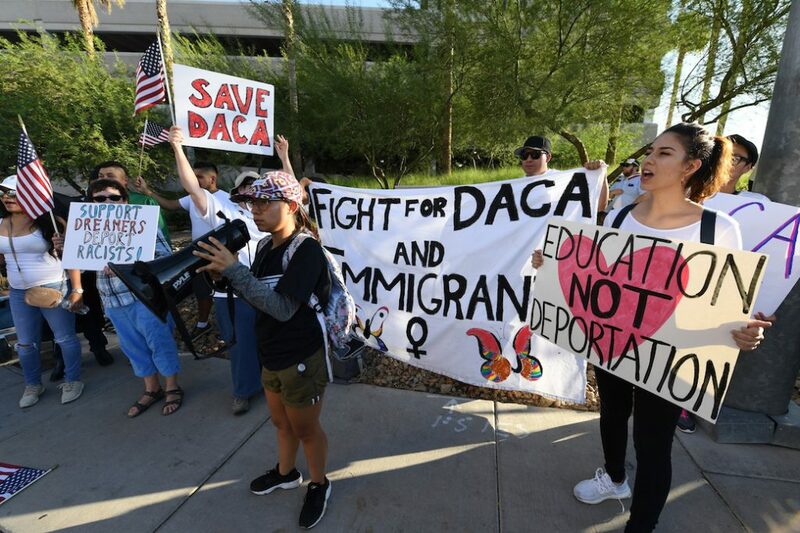 In particular, President Trump’s rescission of the Deferred Action for Childhood Arrivals (DACA) program was a direct attack on Millennial and Generation Z immigrants. Since it began in 2012, DACA has offered a two-year stay of deportation and work authorization to young immigrants who came to the United States as children and who passed a rigorous application process. Amid legal battles surrounding the program, Dreamers can renew their DACA, but U.S. Citizenship and Immigration Services is not accepting new applications, shutting out 120,000 young Dreamers who would age into eligibility when they turned 15. Only congressional action on legislation such as the Dream Act will permanently protect these individuals. DACA has been a lifeline for more than 820,000 Dreamers who, thanks to the program, have been able to work lawfully, attend school, and plan their lives without the constant threat of deportation. These immigrants—DACA recipients as well as the Dreamers without DACA—have been some of the most vocal and organized advocates for reforms that would provide solutions for the broader undocumented community. While young people are often chided for their low voter turnout, they have an aptitude for organizing mass movements around issues they care deeply about—including Black Lives Matter and the “March for Our Lives.” One group of young people in particular has been politically engaged and organizing mass movements for years yet is largely unable to vote: young undocumented immigrants. Despite not being able to vote, many undocumented immigrants are civically active and are mobilizing voters in their communities to turn out to vote. In certain states, young people, representing a large voting bloc, can be powerful advocates for Dreamers at the polls. The opportunity to mobilize for Dreamers is especially ripe in states with high numbers of both young voters and young undocumented people. In states with large shares of residents who are foreign-born such as California and Texas, this may not be newsworthy. But in some states, this could come as a surprise. States such as Nevada and Georgia, for example, rank among the top 10 states where young people could have a pronounced effect if they vote in solidarity with their Dreamer peers. If young people at large reach the level of civic participation that Dreamers have demonstrated, and if they turn out in large numbers to vote with the interests of their undocumented peers in mind, this would dramatically affect not only the midterm election results this fall but would also help set a more progressive immigration agenda moving forward. Charlotte Hancock is the communications director for Generation Progress. Christian Smith is an organizing associate for Generation Progress. Nicole Prchal Svajlenka is a senior policy analyst of Immigration Policy at the Center for American Progress. The authors are grateful to Maggie Thompson and Philip E. Wolgin for reviewing previous drafts of this column. *Methodological note: Eligible voters are U.S. citizens ages 18 and older as identified in the August 2018 Current Population Survey. The analysis is unable to distinguish between registered voters and those who are disenfranchised or unregistered. Data on those eligible for the Dream Act of 2017 come from the University of Southern California’s Center for the Study of Immigrant Integration. Millennials are defined as individuals who were between ages 22 and 37 in 2018; Generation Z includes individuals under the age of 22 in 2018.